With the winter upon us and the cold weather bearing down, I always make tummy warming recipes – and it always includes beef stew. There is nothing better on a cold and rainy day than a nice, steaming, bowl of vegetable beef stew, and some cornbread to warm things up. I think I make cornbread with just about every soupy – stewy dish I make. Is it a Southern thing? Maybe so. All I know is that, and a nice tall glass of water make it all go down so easily. There are several ways to make beef stew, but one of my favorite ways is to add in some veggies and let it all simmer together for a couple of hours. 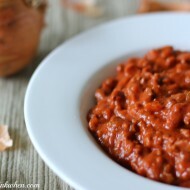 It is one of the most delicious and tummy warming recipes I have ever tasted. 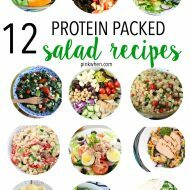 I usually like to share the quick and easy recipes. While this one takes a little more time, it is perfect to make and freeze for a weekday, and well worth the wait for it to be finished. To get started, take a large pan and add the 4 Qts of water, then turn the heat in high. Take the beef short ribs and cut them into bite sized pieces. Add these to the water. Add in tomatoes, potatoes, onion, parsley, garlic powder, beef bouillon cubes, Italian seasoning, salt, pepper, Worcestershire sauce, celery salt, bay leaves, and stir. Then add carrots, celery, black eyed peas, butter beans, corn, and macaroni. Heat on high, stirring occasionally until the stew mixture comes to a boil. Once you have reached a boil, cover with a lid, lower heat to simmer and continue to simmer for 1.5 to 2 hours. 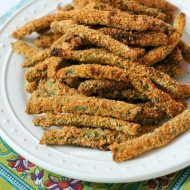 Serve with warm cornbread. 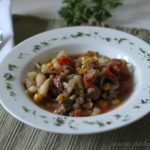 A delicious and tummy-warming vegetable beef stew recipe that is perfect for the cold months ahead, as well as a wonderful dish to make, freeze, and serve later. 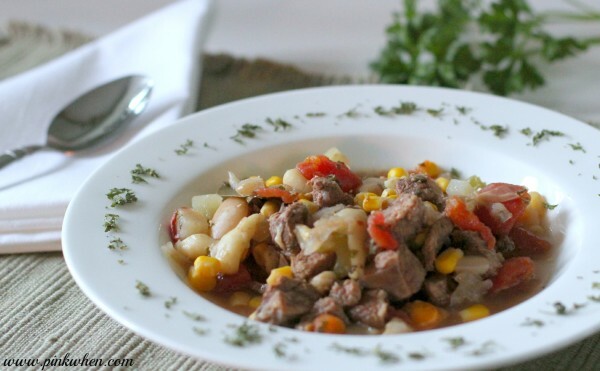 Enjoy this delicious Beef Stew over the winter, and make plenty to freeze for another rainy day. Thanks Lisa! That is actually what my husband says about this recipe….it reminds him of the best Beef Stew he has ever had from his grandmother. That looks great and I agree with you, there is nothing like a good stew in the colder months!! Thanks Michelle! I LOVE Beef Stew! He made me beef stew. And it was special. And I love putting elbow macaroni in mine, although Cassidy never does that. It’s so funny about the elbow macaroni…I always think it sounds weird to put it in there, but because you put so little of it, it never really bothers me. I love that your brother is a chef and made you beef stew. There is just nothing like it! Love it! I am pretty much about to have this with a little twist to it! Happy thanksgiving Jen!